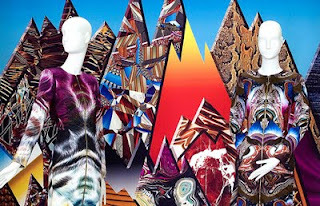 Brazilian-British duo Bruno Basso and Christopher Brooke are pioneers of the digital print process in fashion, renowned for producing unique and inspired textiles and prints. They made history with their groundbreaking 100% digitally printed collection, earning them the prestigious UK Fashion Fringe award in 2004.Their clients include Rihanna and Beyoncé Knowles. In October 2009, Basso and Brooke undertook a ten-day research tour in Uzbekistan, as part of the British Council's New Silk Road project. It also coincided with Uzbekistan's annual Fashion Week. They visited Samarkand, Tashkent and the Ferghana valley, where they spent three days studying traditional ikat weaving at the Yodgorlik silk mill in collaboration with Ruth Greany, from London-based Woven Studio. Greany provided the link between the designers and the mill, helping Basso and Brooke transform their ideas into three unique black and white Ikat prints. All of the fabrics were digitally printed in the pair’s characteristic style and a capsule collection was on show at the Design Museum, London in summer 2010. Visitors could see a myriad of prints processed in the backdrop and then reinforced onto the garments. Two Uzbek weavers went to the UK in spring 2010 for their residency, visiting the designers’ studio and working with Woven Studio.